Next stop Austin. The capital of Texas is a hip, happening city and prides itself on being called the ‘Weird City’. But it’s not so much weird as extremely liberal, with a thriving live music scene and a reputation as the live music capital of the world. It is also emerging as a new destination of choice for tech startups and consistently ranks number one for jobs in the US on the Forbes’ annual list. It also scores highly on other demographic rankings as well and openly embraces alternative life styles. In short, Austin is a cracking city. I loved Austin and there is much for the tourist to enjoy. Rather than me listing all the things that you can do in Austin, check out this website. I followed many of the tips on here and enjoyed every place I visited (including Franklin Barbecue, but more on that in a later post). In fact I loved every minute I spent in Austin and I hope if you visit this fabulous city that you will too. While in Austin I stayed at the Lone Star Court Hotel. 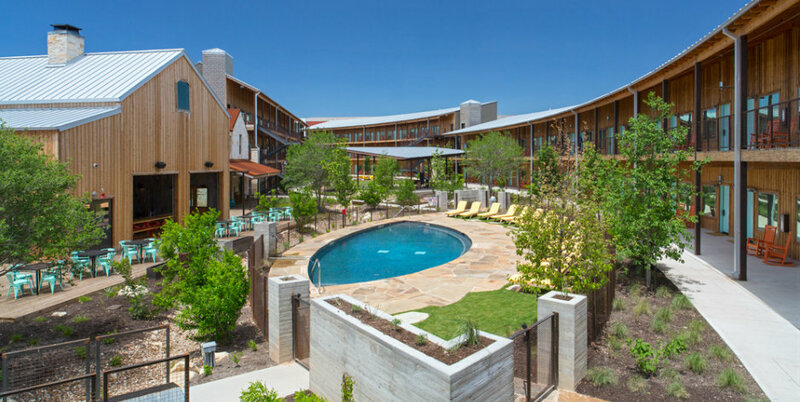 The hotel is located in an area of Austin called The Domain, Austin’s newest commercial and residential district, which is about a 15 minute drive from downtown. It’s not the most centrally located hotel, but in Texas EVERYONE drives. 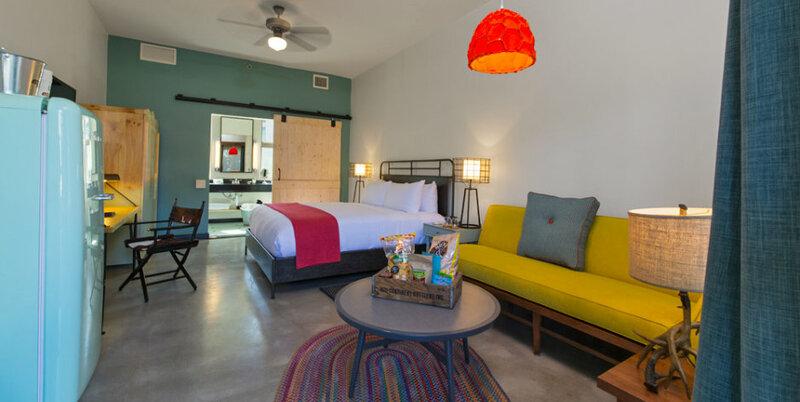 A boutique hotel, Lone Star Court Hotel is every bit as quirky as Austin itself. Visiting the hotel is like a trip back to a bygone era, with the hotel being designed in the vein of a ‘retro-ranch’. The ranch-like buildings of the hotel stretch around in an oval shape, and encase an outdoor area designed for the enjoyment of the hotel guests with a swimming pool and outdoor fire pits. In the guestrooms, each have the usual furnishings such as a 42 inch flat screen TV, but the sitting area is also decorated with other Texan memorabilia such as a deer horned lamp representing the Texas Hill Country, pictures of country singing sensations and a cowhide director chair. There is also a full size “SMEG” refrigerator stocked with supplies displayed in old coke bottle crates. To complete the barn look, sliding barn doors are used to separate the guestroom and bathroom, and outside each room are rocking chairs installed for the comfort of the traveller. The hotel offers first-rate comfort, but with a laid-back approach to service. Therefore car parking is self-service rather than valet, as is luggage handling. The complimentary breakfast is basic and offered as a buffet. Other amenities include a fitness centre and the hotel also offers complimentary bicycle rentals. There is also a regular feature of live music playing in the “Water Trough” Restaurant and Bar most evenings of the week. You really do feel like you’re staying at a quasi-Texan ranch! 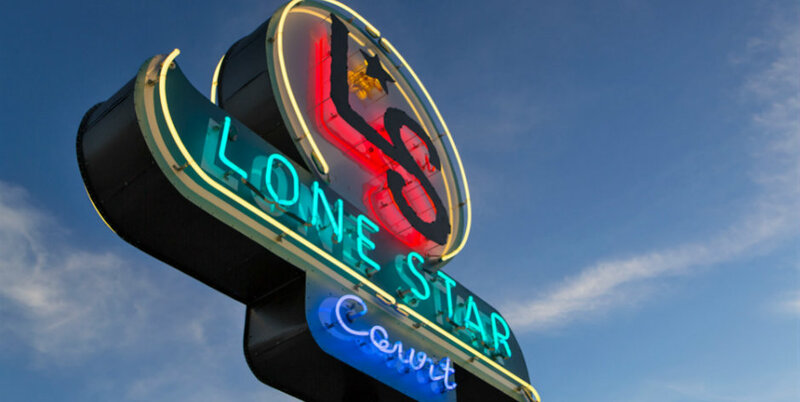 Quirky its design, nothing said Americana more than Lone Star Court Hotel. Lone Star Court Hotel was a hugely fun hotel to stay at, and it was worth visiting for its uniquely originality.